United Nations Secretary-General has strongly condemned today the killing by M23 rebels of a UN peacekeeper in strife-riven eastern Democratic Republic of the Congo (DRC) and pledged the Organization’s ongoing commitment to take “all necessary actions” to protect civilians in the country. In a statement issued by his spokesperson in New York, the UN chief condemned “in the strongest terms” the killing of a Tanzanian peacekeeper who came under fire from the 23 March Movement (M23) in the eastern DRC. According to the statement, the attacks occurred as the UN Organization Stabilization Mission (MONUSCO) supported action being carried out by Congolese Government Forces (FARDC) to protect civilians on the Kiwanja-Rutshuru axis, 25 kilometres north of Goma, which the main city in the vast country’s eastern region. “The Secretary-General offers his sincere condolences and sympathy to the family of the victim, and to the Government of the United Republic of Tanzania,” the statement says. Further to the statement, Mr. Ban says the UN remains committed to taking all necessary actions in line with Security Council resolution 2098 (2013) to protect civilians in eastern DRC. By that resolution, adopted in late March, the Council approved the creation of its first-ever “offensive” combat force, intended to carry out targeted operations to “neutralize and disarm” the notorious M23, as well as other Congolese rebels and foreign armed groups in the east. Today’s incident comes after increased tension in the region in recent days. Just this past Friday, UN spokesman Martin Nesirky told reporters in New York that MONUSCO was on “high alert” following early morning clashes between Congolese Government forces and M23 armed combatants. He said at that time that the Mission reported that Government forces and M23 had exchanged mortar and machine gun fire near Kibumba, around 15 km north of Goma. Voxafrica reported that Congo’s M23 rebels clashed with government troops for the first time in nearly two months this morning, and neighboring Rwanda said Congolese army shells had landed on its territory. The clash came days after peace talks broke down in the Ugandan capital Kampala. M23’s military commander, General Sultani Makenga said the rebels came under attack at 4 a.m. local time at Kanyamohoro, around 15 km north of Goma, the largest city in eastern DR Congo. Congolese army General Lucien Bahuma said M23 fighters had attacked first and fighting was continuing. Reuters reported that fighting was intense and continuous this morning as Congolese army troops bombarded rebel positions with heavy artillery. According to the Rwandan army, the Congolese army fired three shells and small arms into Rubavu district, just over the border from Goma and close to the Rwandan city of Gisenyi. MONUSCO chief Martin Kobler and Special Envoy of the Secretary-General to the Great Lakes Region, Mary Robinson, today jointly expressed their concern about the ongoing violence in eastern DRC and urged all parties to exercise “maximum restraint” and to return to peace talks in the Ugandan capital, Kampala. AfricaReview reports that UNSC will be conducting an emergency meeting on situation in DRC sometime this week. In the past year, clashes have continued sporadically throughout the DRC’s eastern region, with rebels briefly occupying Goma, in November 2012. The fighting has displaced more than 100,000 people, exacerbating an ongoing humanitarian crisis in the region which includes 2.6 million internally displaced persons and 6.4 million in need of food and emergency aid. This recent attack by M23 rebels on UN forces seem to contradict recent reports by some UN officials that DRC government is on the verge of overall victory. AfricaReport quoted sources in UN DRC command centre as saying DRC army had recently preemptively attacked and captured the rebel stronghold of Kiwanja, Kibumba, and Rutshuru by Sunday which had been in rebel hands for just over a year. United Nations accuse Kagame of sponsoring M23 rebels.UK and the West have cut aid to Rwanda in protest.Kagame wants DRC to do more on Hutu malitia who commited 1994 genocide who are believed to be hiding there. Kagame holds key to peace in DRC. The support of the DRC army by the UN brigade and the weakening of the rebels has fuelled belief that the government could defeat M23.”We are consolidating the zones we have conquered. We will continue to do our jobs as soldiers,” Army spokesman Colonel Olivier Hamuli told UN radio Okapi. Hamuli told Reuters that M23 fighters had deserted the rebellion, with some 40 rebels taking advantage of a corridor created by the government troops to allow them to flee rebel lines.Peace talks between the DRC government and M23 rebels in Uganda stalled last week when the rebels demanded a full amnesty for their leaders. M23 threatened to return to fighting when DRC President Joseph Kabila ruled out a blanket amnesty.The threats forced the DRC army to preemptively attack on Friday and after three days of fighting, the rebels have lost all strongholds. Congo’s army scored its first victories against the rebel movement, in late August, forcing them away from Goma.Hamuli said some M23 fighters had fled towards the Rwandan border in the face of the army advance. M23 rebel stronghold is in the East close to the border with Rwanda. Kagame can defuse them only if his concerns are addressed. Warchild.org.uk describe the rebel movement as having begun in April when a group of army soldiers mutinied and formed a rebel group called M23 and have been fighting the army for control of territory in North Kivu since then.The soildiers complained that DRC government had refused implement the terms of a March 23, 2009 peace deal signed with a previous Rwanda-backed rebel group. 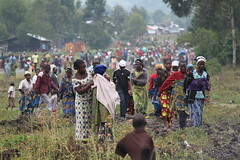 The March 23 Movement is often referred to as M23 or the Congolese Revolutionary Army ,mainly operates in the eastern province of North Kivu.The group which started only as a mutiny of 300 soldiers is increasing in strength and On 20 November 2012, they took control of Goma, a provincial capital with a population of one million people. The mutiny cited poor conditions in the army and the government’s unwillingness to implement the 23 March 2009 peace deal. General Bosco Ntaganda, also known as “The Terminator”, was accused by the Government of Kinshasa of leading the group, and President Kabila called for his arrest on 11 April 2012. The M23 is made up primarily of Tutsis and opposes the Hutu Power militia Democratic Forces for the Liberation of Rwanda (FDLR) responsible of 1994’s genocide against Tutsi in Rwanda as well as area Mai-Mai (community militias mostly created and supported by the Democratic Republic of Congo). UN has alleged that Rwanda’s President is sponsoring M23 rebels. It an allegation he refuses but West is already restricting aid to Kigali until Rwanda forces M23 to disarm. Following military successes, M23 rebels have made additional demands, citing issues of human rights, democracy, as well as good governance. They have accused President Kabila of cheating in the November 2011 elections.The rebels have threatened to march on Kinshasa and depose the president. Whilst the main town of Goma remains in government control, many of the outlying towns and villages have been attacked. Situation in DRC is complex in the sense that President Kabila although has support from old allies like Zimbabwe has never been in total control of security situation. DRC National Army lacks discipline so much that local people in Goma often are just as afraid of the government troops as they are of the rebel soldiers. It can often be difficult to tell the difference between them. Posted on 28th October 2013 by newsafrica. This entry was posted in Africa, Headlines, Rwanda, Zimbabwe and tagged Africa, Democratic Republic of Congo, DRC, Headlines, Politics, Rwanda, Security, Tanzania, UN, Zimbabwe. Bookmark the permalink. « Zimbabwe: Which is which?